I have to admit that there are times when I absolutely love the English language. A friend of mine is learning Chinese and we were chatting about learning a new language. I learned British Sign language about 5 years ago and loved it but found thinking in a whole new way quite challenging. It isn’t simply translating every English word into a BSL word and performing it. You have to think totally differently. In BSL you are storytelling with your hands in broken English. For example “I was leaning back to get a book and fell off the chair in the library” is a fairly simple sentence. A two second sentence can almost turn into a pantomime. Still, as a word lover and drama queen I really enjoyed the storytelling aspect of it all. I especially loved breaking down English sentences into the most basic words and rebuilding it again. 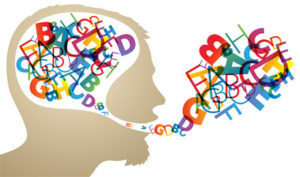 BSL uses facial expressions, body language as well as the words and you have to think of language with your whole body. I come from a fairly large City in England where our accent is pretty lazy. My particular citizens are known as Chizzits. Why? Well, we have a habit of slurring all of our words together and “Ah ma chizzit.” comes from the slurring of “How much is it?” We also talk quite fast and run all of our words together. Many language have different intonations within words which make the word mean different things. I was lamenting to my friend that English doesn’t seem to do this when she pointed out that sometimes one sentence can mean different things depending on where you put the emphasis. It took me a while but I realised what she means by the following sentence. Every single word can change the meaning of the entire sentence depending on where you put the emphasis. “I don’t think you said that to him.” means someone thinks you said that to him but it’s not me. “I don’t think you said that to him.” means I’m defending myself because someone has said that I do think that. “I don’t think you said that to him.” means I’m not entirely sure whether you said it to him or not. “I don’t think you said that to him.” means I believe someone else said it to him. “I don’t think you said that to him.” means I believe you thought it even if you didn’t say it. “I don’t think you said that to him.” means I think you said something different to him. “I don’t think you said that to him.” means I think you said it behind his back rather than to his face. “I don’t think you said that to him.” means I think you said it to someone else. One sentence, eight possible meanings. Ladies and gentlemen the English language. Geroffa’im (Get off him) Usually said when there is a fight.